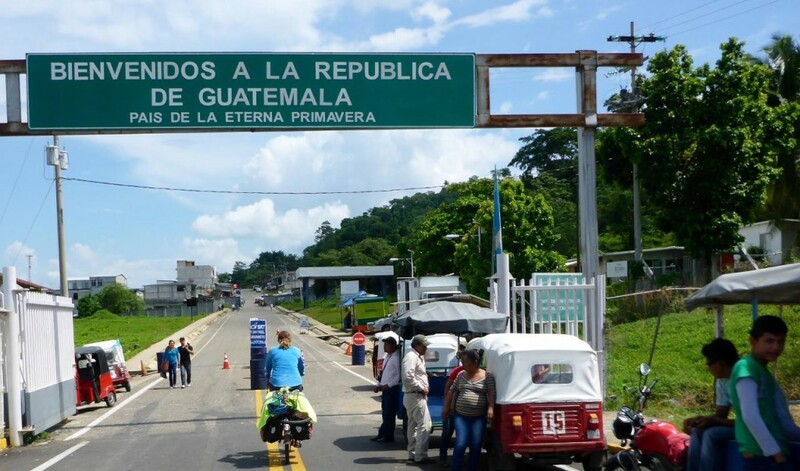 Guatemala – Our 27th country! We got a late start from Palenque due to a computer problem that my son Cary helped fix while talking with him through Jocelyn’s Skype. Skype is wonderful and Jocelyn talks with her mom (Andee) whenever we have Wifi. We also had a few bicycle issues that we worked through. As a result we didn’t get on the road until 11 which is very unusual for us. 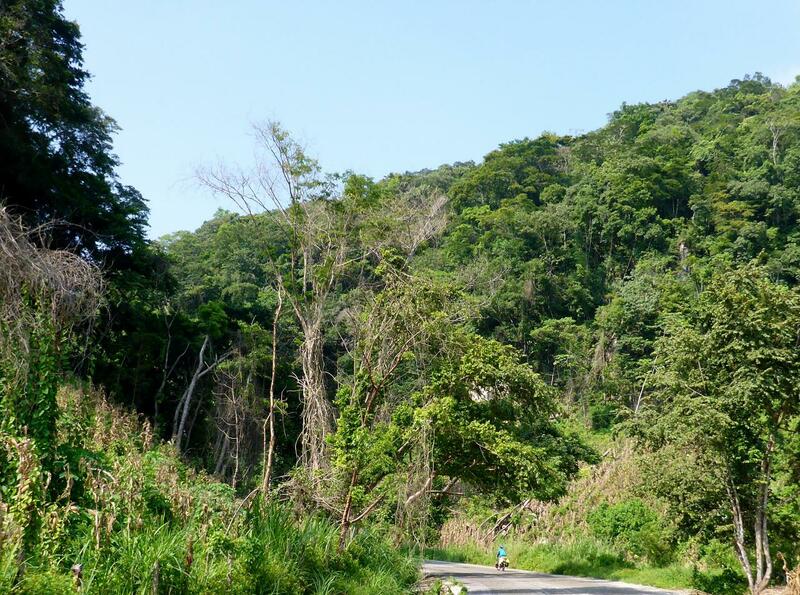 Right outside of town the growling of howler monkeys took over the otherwise quiet road. Between them and all the birds sometimes we couldn’t even think! 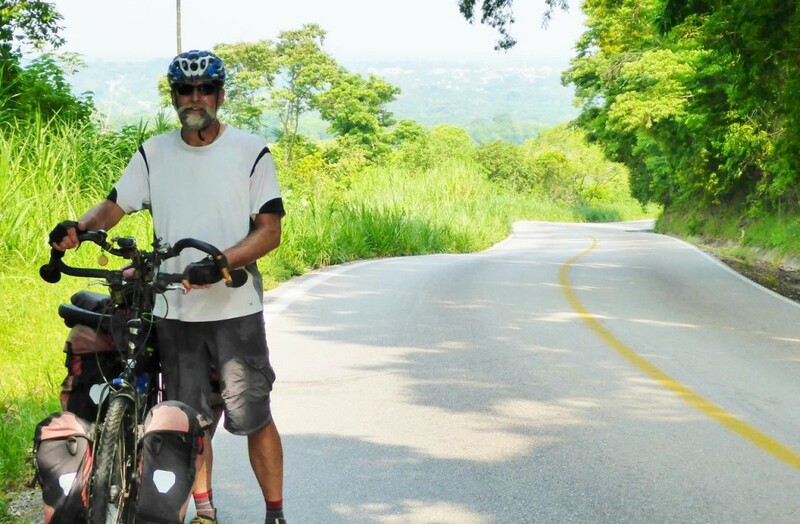 The day was a delight with a few long steep climbs but grand vistas as we rode through the mountains towards Guatemala. It was a late day as we made 56 miles to the town of Tenosique and it was also one of my favorite rides in Mexico. 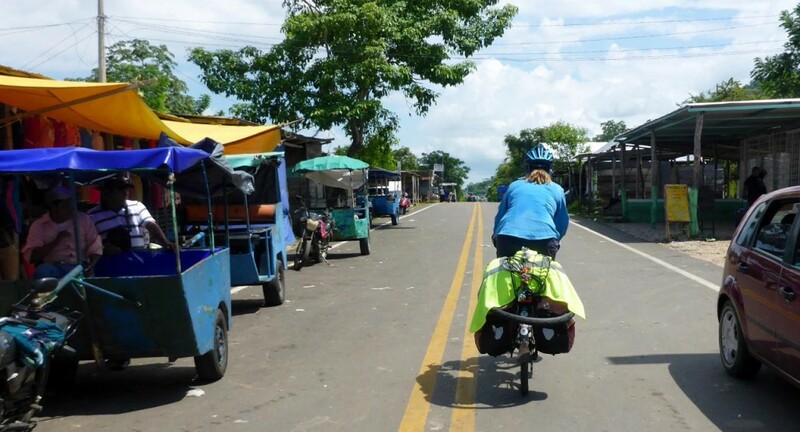 A few days ago as we rode through the major city of Villahermosa I was hit on my left rear pannier by a minivan bus on an overpass. I then hit the guardrail, bounced off that and did quite a wobble trying not to fall. A similar situation happened last year in Spain when a truck’s whoosh of air threw me again the guard rail. Fortunately there was a guardrail as in a lot places they are non-existent especially on overpasses. The cars behind me managed to miss me also. Since then my right knee has been hurting. I’ve had three arthroscopic surgeries on this knee with torn meniscus (cartilage) and think I have torn it once again. In the scheme of things we have been very fortunate on the road as we try to stay out of high traffic areas. But sometimes they are unavoidable. On another note we were told that Central America starts in southern Mexico around Villahermosa. So we are now in Central America. It was another 56 km (about 35 miles) to the border town El Ceibo which we passed though without having to pay a 330 peso exit fee that others have paid. 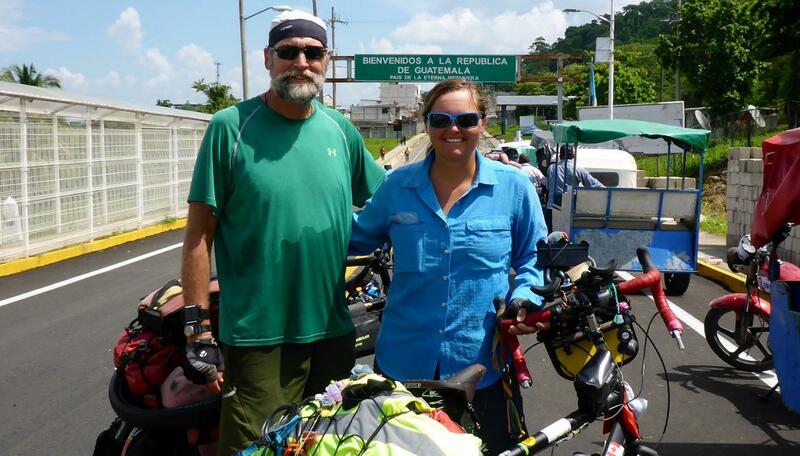 It was a very friendly transaction as we checked out of Mexico after 2 months and 6 days and 2,434 miles. The border patrol was very interested in our trip. 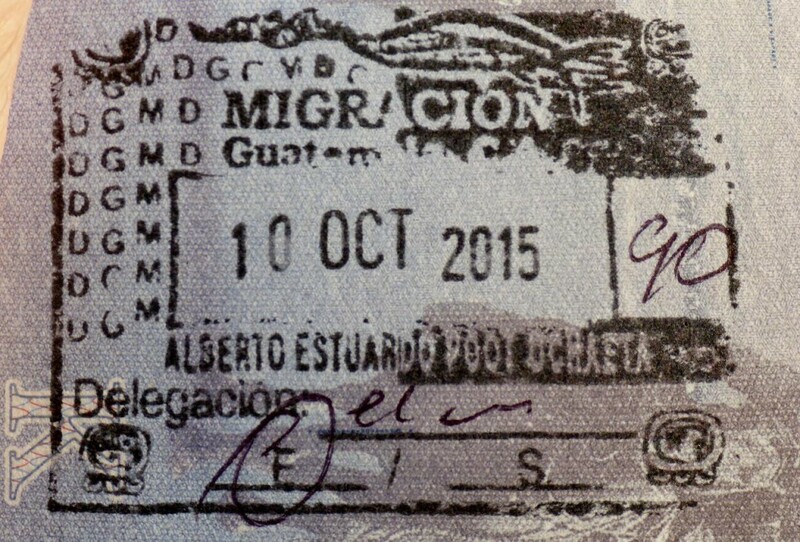 We crossed over and checked into Guatemala with more very friendly people. What a delight as border crossings have sometimes been very stressful. I remember checking out of Tajikistan without my entry paper from Dushanbe as I had thrown it away. The guard kept saying I had to return to Dushanbe as my “papers were not in order”. Once I gave him a $50 USD bill all was okay. Before we exited Mexico Jocelyn asked if I had my entry paper. I said yes and I did not want to cycle back to Tijuana! And with two very friendly welcoming committees of three beer drinking Guatemalans on horses with their dogs and two hogs we thought “it don’t get much better than this”! We quickly found delicious food and Guatemalan cervezas. 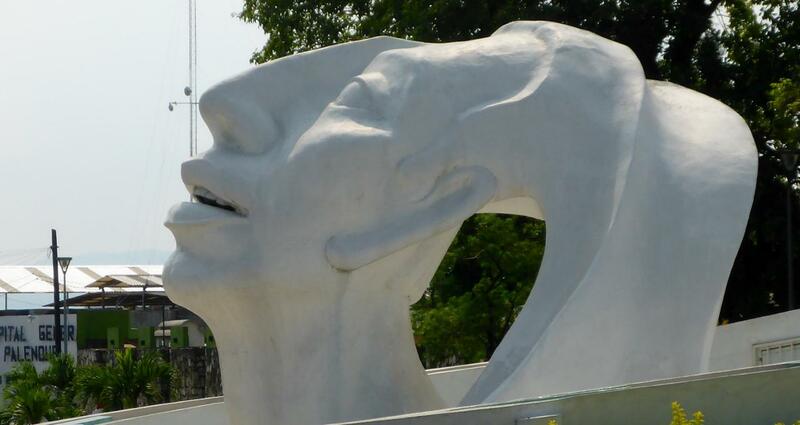 We then continued for the rest of the day and the next to the city of Santa Elena and the island of Flores which is situated on a huge lake in the city. We will once again take a day off and bus to the old Mayan city of Tikal. 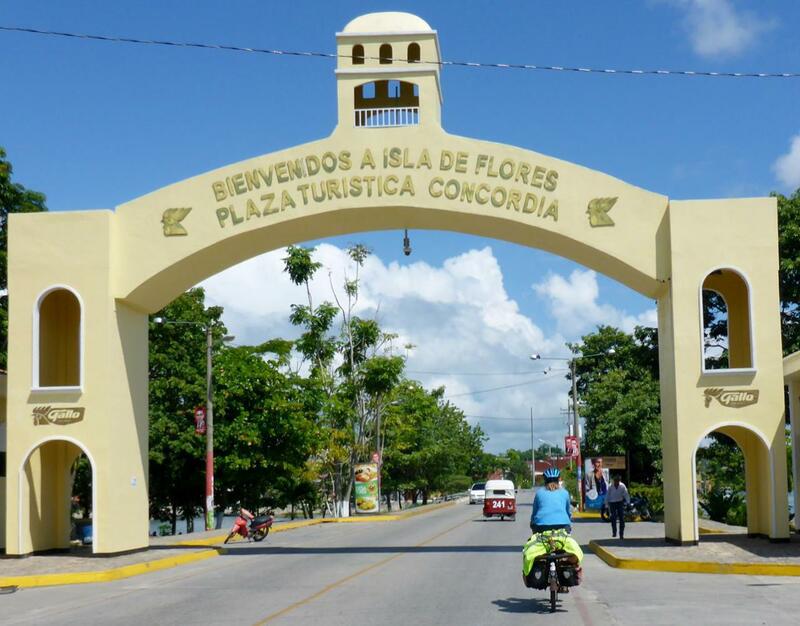 We wanted to cycle there but since we will have to return this way to continue our ride through Guatemala we will bus it and spend two nights here. Mayan royalty attached boards to their children’s heads to give their heads the elongated look in order to distinguish them from the commoners. 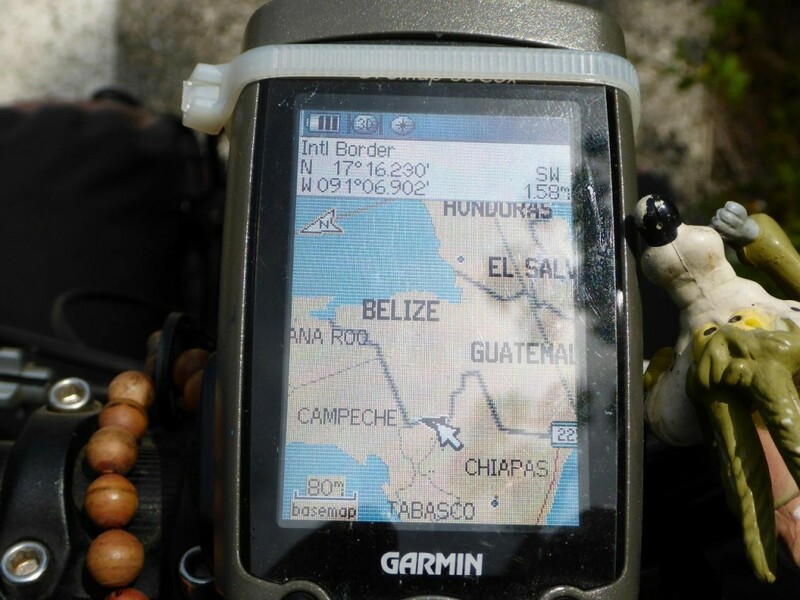 The last few days we have ridden through areas of howler monkeys. This is the best picture we got of one. 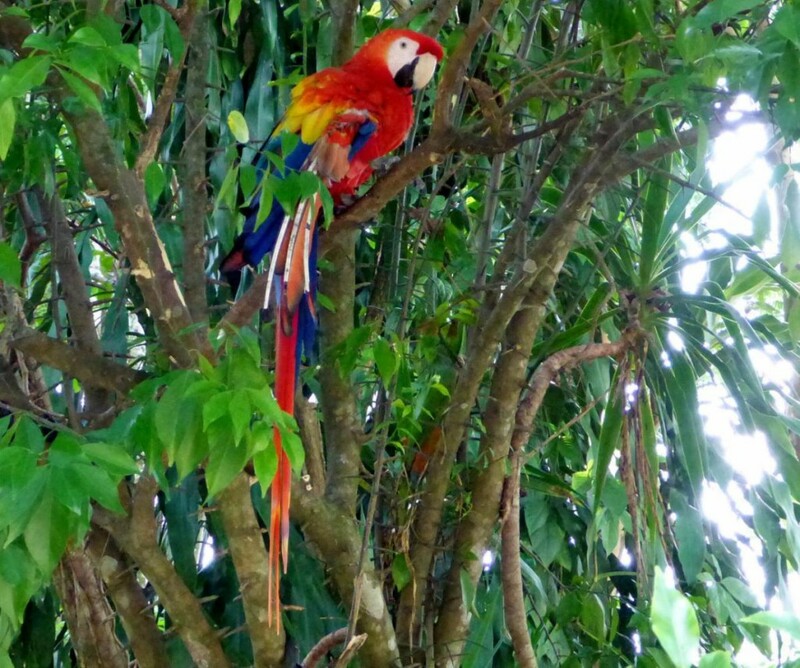 The jungle here is so alive with noises. Climbing out of Palenque (in the background). What a beautiful riding day. A farmer burning his field. 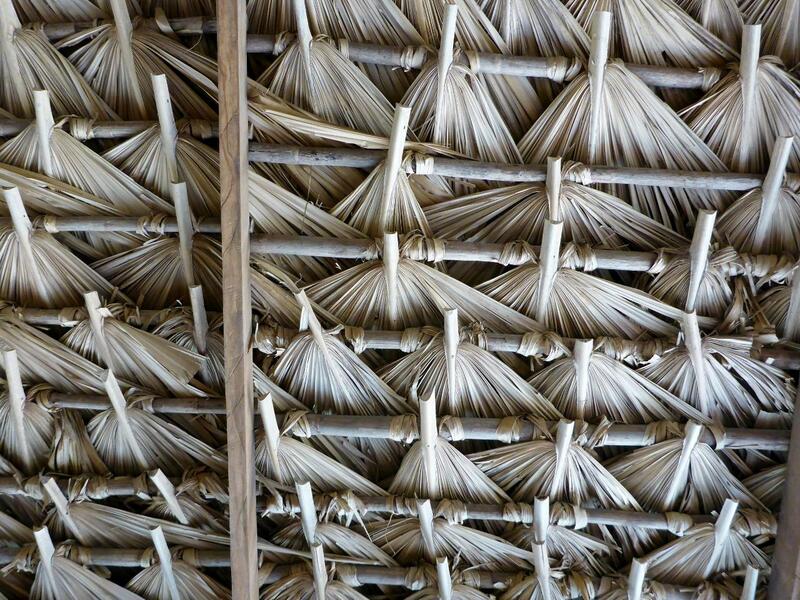 A very fine palapa structure. 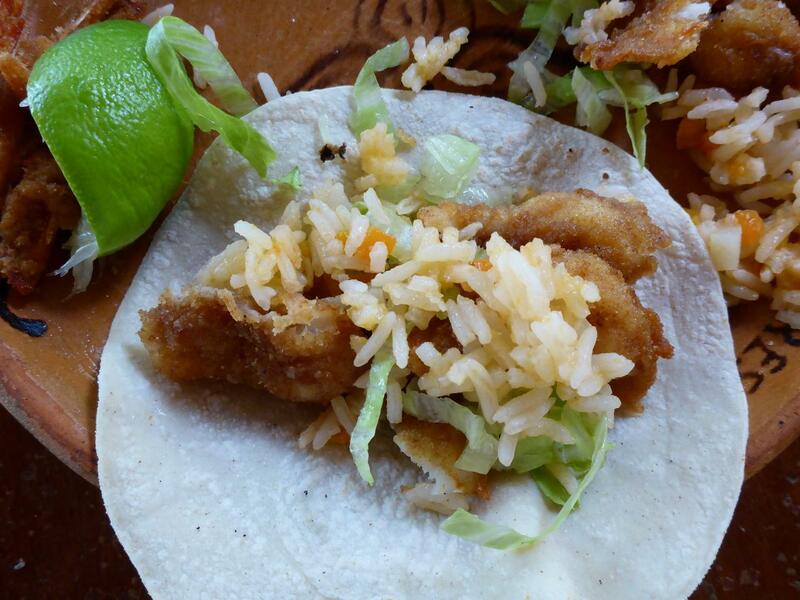 We like to order shrimp and make our own tacos. Fresh tortillas are served with every meal. School kids throughout Mexico wear uniforms. A fine bridge and another Where’s Waldo? After two months and 6 days and 2,434 miles in Mexico the Mexican military was with us everywhere. A new country awaits us! Everyone walks at some point. Enjoying our last few miles in beautiful Mexico. The howler monkeys were really loud here. I’ve been doing home repairs wrong. 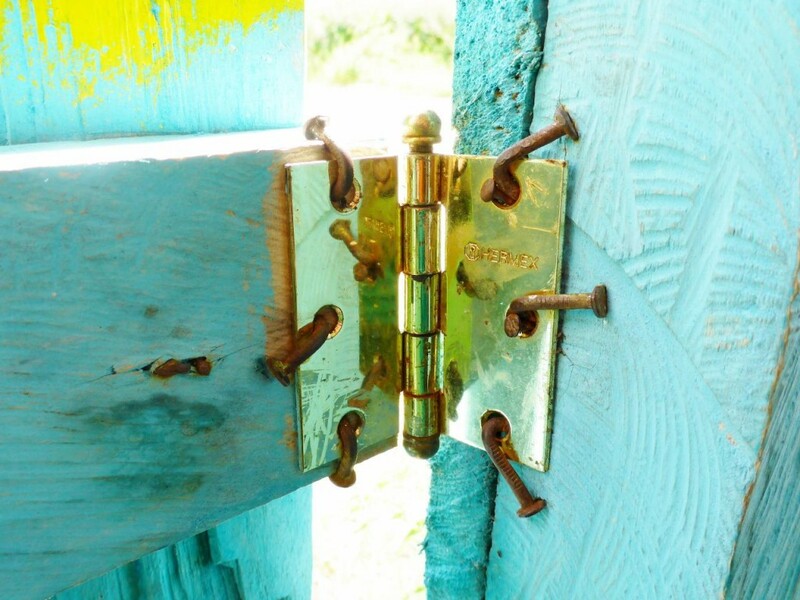 So this is how to install a hinge. 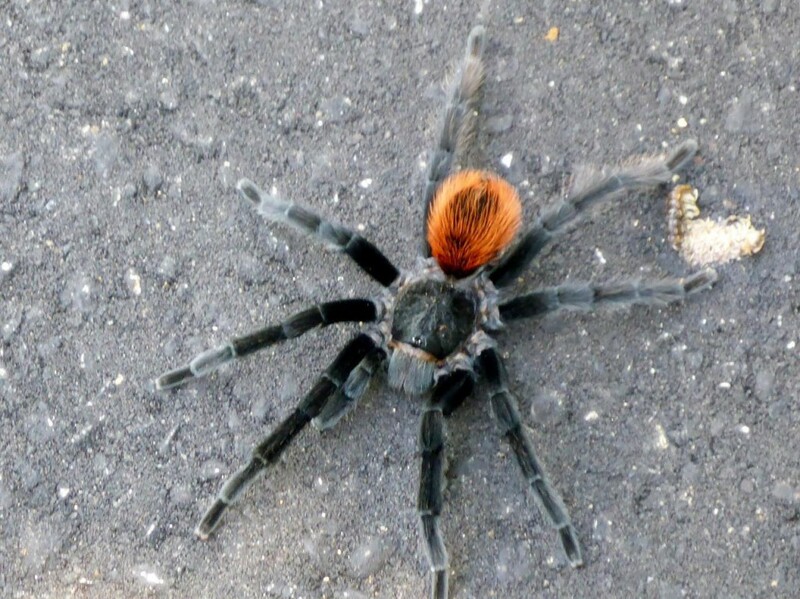 Our first live tarantula. They are very fast! 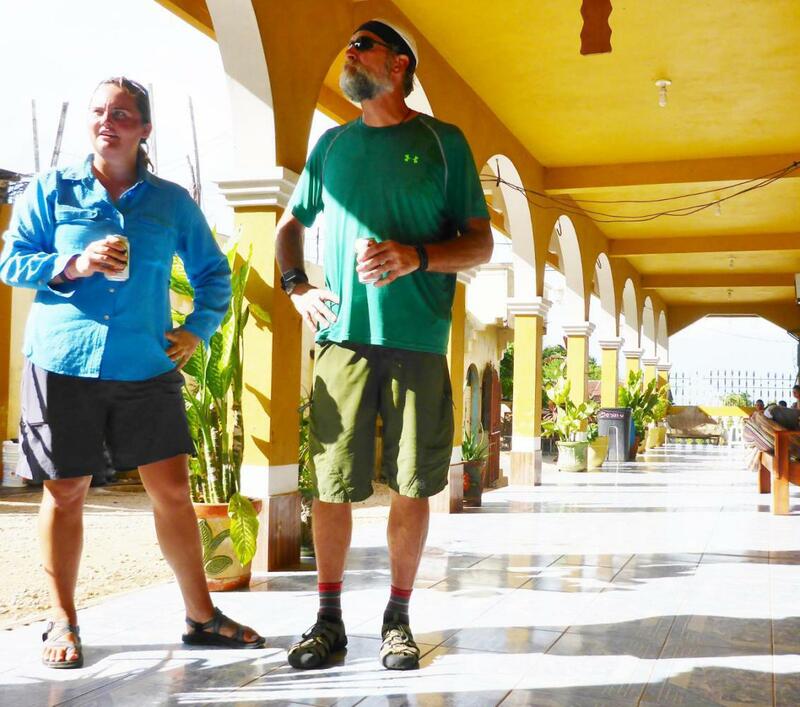 Trotting down main street at the Guatemala border town drinking beer – our welcome to Guatemala committee. They offered to let us ride their horses and they our bikes. 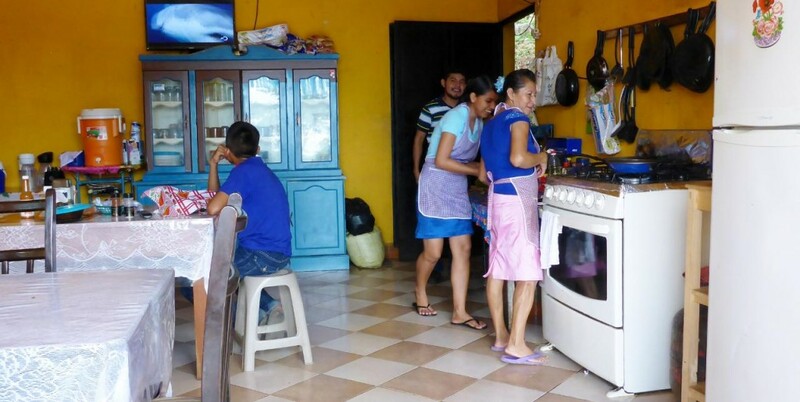 They were just giddy to make us gringos lunch. A break at the border before continuing. 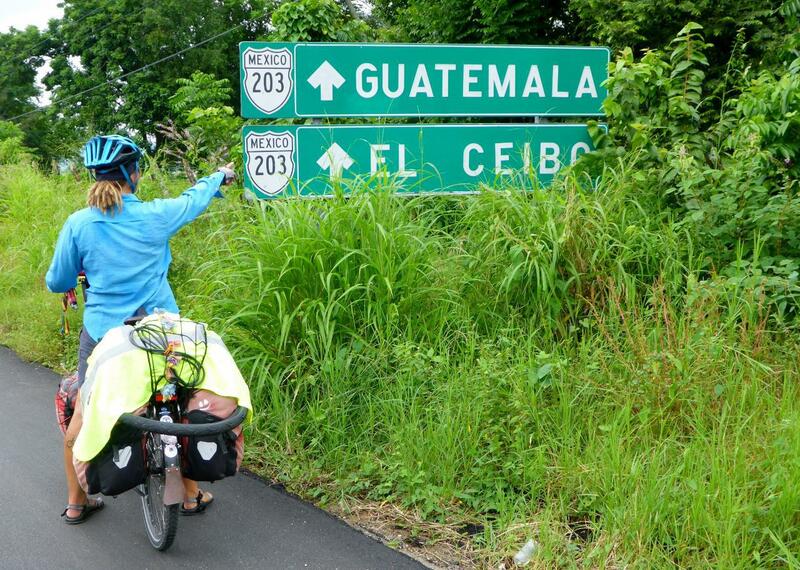 Guatemala is as green as New Zealand! 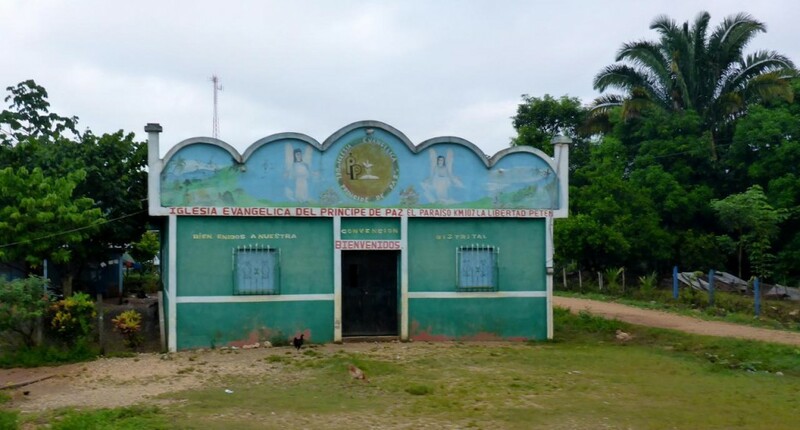 A typical house in the Guatemala countryside. 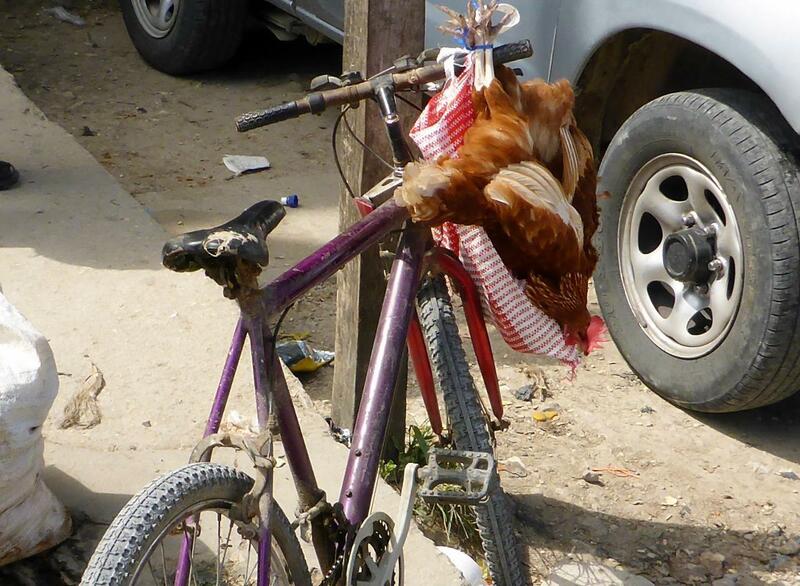 Even chickens like riding on bikes! These two were alive. An island in Santa Elena. Beautiful lakeside property in Santa Elena.